Spacemusic is a vague free-form genre, one without narrative, nor lyrics - yet everyone who listens to this music knows exactly what it is about. 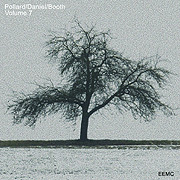 From out of a continuing series of synthesizer ceremonies by Pollard Daniel Booth comes Volume 7 (76'01"), the radioactively listenable interplay of three musicians. Linked to the quiet corners of the mind, Volume 7 in a succession of live releases superbly celebrates the power of imagination. Featuring two tracks, one a live concert recording, the other a lost studio jam, this release finds this trio in excellent form. A torrent of impressionistic moods and intricate energy levels, the precious loneliness of this album's dark moments gives extra weight to its pulse charging sequencer play and ominous tone. The sounds themselves seem to have an independent intelligence - meant to move the hidden activity within our heads. As full-bodied synth leads make steep melodic runs against an undertow of Mellotron choirs, strings and brass, dancing tone patterns echo and advance in machine precision. Journeying further into space, racing electronic palpitations extend to epic proportions - in a charge of creativity meant to electrify the imagination. Berlin-School cosmic music collectors should want a copy of Volume 7 (and the previous six) - as its sound and spirit connect solidly with the noble values of this ever-growing collective. The music technology may seem dated, but the atmosphere this outfit generates remains ever in the near future. The monumental output of Brendan Pollard, Michael Daniel and Phil Booth may be traced back through the miles of circuitry within a collective brain, to the easy mastery of their craft - which comes from their many years of experience working with each other. The night may have a thousand eyes, but while listening to the work of Pollard Daniel Booth it would seem that it has but two ears... yours. There is another reality, one reachable only through art and music... and so it may be that this trio actually enjoys more the heightened cerebral state that their sessions lead to, than they do the musical realizations yielded from them. 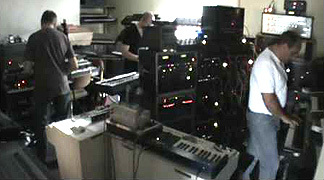 Their jam sessions are more than a mere assemblage of keyboards. It is three men acting on a yearning for the transcendent.